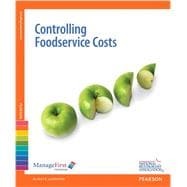 This text focuses on CONTROLLING FOODSERVICE COSTS topics. It includes essential content plus learning activities, case studies, professional profiles, research topics and more that support course objectives. The exam can be taken in either a paper-and-pencil or online format. The exam format is selected at the time of purchase. The text and exam are part of the NRAEF ManageFirst Programfrom the National Restaurant Association Educational Foundation. This edition is created to teach restaurant and hospitality students the core competencies of the Ten Pillars of Restaurant Management. The Ten Pillars of Restaurant Management is a job task analysis created with the input and validation of the industry that clearly indicates what a restaurant management professional must know in order to effectively and efficiently run a safe and profitably operation. The NRAEF ManageFirst Programtraining program is based on a set of competencies defined by the restaurant, hospitality and foodservice industry as those needed for success. This competency-based program includes 10 topics each with a Competency Guide, exam, Instructor Resources, certificate and credential. * This Competency Guide includes an ONLINE TESTING VOUCHER .